diana,can not thank you enough for these books and for your wonderful writing I’m on A Breath of Snow and safeness its next to the last. this story is wonderful and fills my hours I live alone and ther is nothing better then a warm blanket and a good book to see you through.I do not know what to do when these end,I guess start book one again. happy holidays and for wanting to learn how to write a novel. There are two books after A BREATH OF SNOW AND ASHES–AN ECHO IN THE BONE (#7) and WRITTEN IN MY OWN HEART’S BLOOD (#8). Hope you enjoy those, too! I started reading your books (and rereading them) in about 1990. They make me laugh, cry and always care about the characters. On top of that I enjoy learning about the history of the 18th century and the little tidbits about herbs. I am really glad that you started to write and have continued to go on. Thank you. Between 11/26/14 & 1/3/15 I read all eight books. However, I am 74 years old and would like to know how the saga ends. Please hurry up and write. 1. Is there any truth that Jamie also turns out to be a time-traveler? 2. Claire takes him with her to our time where they retire to a senior community in Florida an die of boredom. Life goes at its own speed, and so do books, I’m afraid. [smile] But no, Jamie is not a time-traveler. One day I was at a thrift store and I was browsing through the books they had (I love to read). Anyways, I came across your book, “A Breath of Snow and Ashes”, I thought to myself, hmmm, this sounds interesting. So I bought it. Now, at this point in time I hadn’t had a lot of time to read, so I put the book in a stack of books that I was going to read as soon as I had the time. You see, my husband is in the Navy and after finally feeling settled in one place, Virginia Beach for 11 years, I thought we’d be able to stay and retire there. But the Navy had other plans for us. They shipped us clear across the country to a place I’d never heard of, (Lemoore, CA; It was there that I found this book). I knew we wouldn’t be staying there long due to the fact of not having proper medical facilities for my family. Sure enough, 6 months later we were sent to San Diego. At, this point I’d pulled out your book and started to read it, and made it through the 1st chapter, then I was forced to put it down due to having too many things to do. One weekend our satellite company offerd the premium channels for free (trying to reel in customers, lol). I saw the very 1st episode of “Outlander”, and I recorded it to my DVR, so that at a later time I would subscribe to Starz only because I liked the 1st episode. 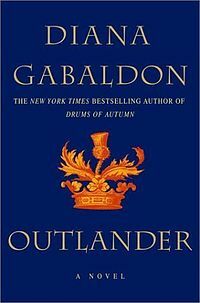 Well, I haven’t subscribed to it yet, but I did pick the book up again, and as I continued to read it, 1) I felt like something was missing, (seems it was, the 1st 5 books before it, lol) and 2) It reminded me of the very 1st episode of “Outlander” I saw on Starz. I said as much to my husband and I informed him that I will be subscribing to Starz whether he liked or not (that didn’t go over easy, so I had to bargain with him, but I now have Starz and plan to search for it ,OnDemand. Today however, I got curious, and Googled you. Low and behold, I WAS SHOCKED! I couldn’t believe it, the book I was really beginning to love was the TV series I wanted so badly. Then, I realized that I would have to put the book dow again, and read no further. Not until I have the chance to purchase the rest of your books, especially the 5 books that came before them. It will take me a good while to be able to purchase them, due to not having the funds I need to get them. You see the housing market isn’t that great, and my husband and I bought a house while we were living in Virginia before the housing market crashed. We are stuck having to rent it out for $400 less than our house note, and we have to pay the rental agency as well. Now we are here in San Diego, and yes we are living in Military Housing, we are still losing money. Plus we pay my parents and his mothers house notes as well considering that they live on limited funds (they receive Social Security Disability), which isn’t much. I’ve no clue as to why I’m telling you my story, I had originally just wanted to get on here and let you know that I have been reading books avidly for 24 years, sometimes 1 a day, and I wanted to let you know how much I have enjoyed reading the first 1/3 of the 6th book. I am now starting a “savings jar” so that I can purchase your other books. I tried my local library and for some reason they do not have them. Maybe they are crazy. Anywhoos, keep writing and don’t stop. I haven’t gotten to the last book written, but I think it would be pretty awesome if close to the end Claire and Jamie could somehow be transported back into the 20th century. Of course, who knows what to do about Frank. Don’t worry, I’m not giving you advice, it’s just as I read a story I think, “wow, what if this happens”, my own imagination getting away from me. I definitely think your library is crazy. It’s sometimes possible to find cheap copies of paperback editions of my books, used, on sites like Abebooks.com or Alibris.com. In any case, I hope you’ll soon be able both to watch the Starz series (which I’m _sure_ you’ll love!) ad read the books. I really wish I had discovered your books years ago! A friend suggested them last summer when I was laid up with a dislocated shoulder (must have been worse than Jamie’s…it took three tries to put it back). I started Outlander in July then found out about the Starz series. Loved the book and promptly bought the next seven books. Finished the eighth book in September (I’m retired so I read a lot) and immediately started again! Read them all again but slower this time (missed a lot by reading too fast). I love all of your characters and feel like they are friends. Of course I love Claire and Jamie both individually and as a couple. In fact I enjoy all the couples and their different relationships. And I absolutely love Germaine and Jemmy. Thanks for these beautiful books! I am a 72 year old great-grandmother and reading is my hoby. I just finished all eight books for the second time. My favorite book subject is historical fiction. You are the best author I have read and can’t wait for the next book in the series. Thank you for keeping a senior citizen young at heart. Can you please get your finger our and publish episode 9. I have recently finished 8 plus all the novellas and I am now suffering withdrawal symptoms because I cannot get a new Outlander fix. I know it takes time to write a story as good as Outlander but please take pity on a poor mortal. I have tried various other suppliers but have yet to find a product that has the same effect so I suppose I shall just have to wait impatiently, suffering these withdrawal effects until it happens. I am new to your series, thanks to Starz ! I absolutely love the series. I am so compelled now to read the books now reading is way more interesting and imaginative than the visual form. Thank you for being an inspiration to all the future writers out there dreaming of writing and publishing there own stories. I was delighted to realize that so many of your other fans also re-read and re-re-read your books. I made the mistake of buying the earlier ones in paperback and they’re now falling apart from so many re-readings. I now plan to buy the earlier ones in hardback. I’ve been working on my own historical novel for a long time, but keep re-writing parts of it, so I may never actually finish it, let alone submit it for publication. Every time I read or re-read one of yours, I feel inspired to try to improve my own. At the moment, my goal isn’t so much publication as just exploring the many possibilities of my story, but since I’m now 77 years old, maybe I’d better get on the stick. Just before Christmas, I stumbled across the Visit Scotland leaflet about the Scottish locations for the TV series (we live in Scotland) and that led to a box set, since the TV series must, obviously, be a “big thing” to get VS that worked up. We were intrigued. My partner and I have just finished watching all of series1 and have thoroughly enjoyed it. She has read the first book and has just bought the second – enough said. We liked the little nod to the book’s origins in having Frazer Hines, the original “Jamie”, have a part in the last episode. The premise is, of course, fascinating, the general story and plot-lines are good and strong, and the acting and locations spot on. Great stuff. You must be very happy to have persevered with writing that first novel. Love the Outlander story on Starz, am waiting on season 4 to be completed. Going to buy the books to read “the whole” story. I hear the books are the best. New copies of Diana Gabaldon’s hardcover and paperback books–signed by her–are available for purchase from the Poisoned Pen bookstore. There is no charge for the signature, but you do pay shipping. The Pen ships anywhere in the world. Click here for Diana’s books available from the Pen. Be sure it says “Signed” in the description of the book before adding it to your Pen shopping cart, to ensure that title is available signed by Diana. I used to dream of writing novel way back when I’m seven. But never started. My husband and I love your Outlander. Thanks to Netflix. But I would like to read the books..maybe it’s more interesting and intriguing and romantic. Do you have surplus copies? I would love to have it with your signature.